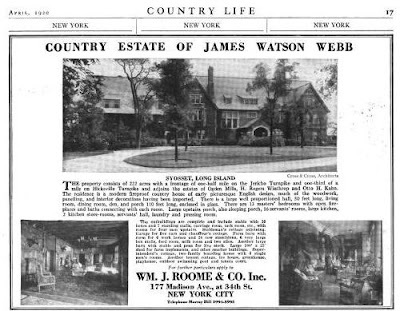 An advertisement for 'Woodbury House', the James Watson Webb estate designed by Cross & Cross c. 1915 in Woodbury. Click HERE for more on 'Woodbury House' and J.W. Webb. and HERE to see 'Woodbury House' as it looks today. How is the house used now? Rented as a venue for special events? Municipal offices? Storage for park equipment? There appear to be Town of Oyster Bay offices inside but the times I have been there I have not seen a soul. Here it is on Bing: http://www.bing.com/maps/?v=2&cp=qt1hht8w8q3k&lvl=19.47840113282057&dir=341.6179129063788&sty=b&where1=Syosset%2C%20NY&q=syosset%2C%20new%20york&form=LMLTCC I think it’s a good looking house & am grateful it hasn’t been demolished. Having said that I suspect it will remain only until 1) it needs some expensive work, &/or 2) someone on the board that controls this house gets itchy to build something ‘new’ (which, in all honesty will probably be more practical for the park). *sigh … *just sigh. I wonder if the negative experience his parents had with a shingle-styled home (with harsh winters) back in Vermont influenced his decision for the building materials. Their Shelburne House facade was converted to brick which, in very rare occurrence, didn't detract from the lovely lines. Off topic but the California-based auction firm that had Chateau des Thons (27 Wolver Hollow Rd, Glen Head, NY) shows on their website as 'sold' for $3.2M. No such info exists on zillo or redfin. i know tempus fugits but this is an extreme example. to compare the 1953 pic with the present is almost unbelievable. i think this is a great house too and its too bad the town doesn't make better use of a great asset. The HA link shows the progression of development. Follow the link to where the Webb's moved in 1921. I can't say 100% that the house link was the Webb home. If it was it seems to have been a downgrade from where they came from. Although the Mrs. had to have her Playhouse!